I always fall into a pit of despair when my kids hit their eight-month birthdays. At that point, they're mobile, which means they have the necessary skills to get into a ridiculous amount of danger and trouble in a short amount of time, and they think they can do it all on just one nap. If it were only that though, I don't think I would be as dramatic as calling it a pit of a despair. A pit, maybe. But not of despair. But coinciding with this eight-month mark, they also stop listening to books, except to rip them to shreds with their chubby little fingers. And that, no question, is despair-worthy. Luckily, something miraculous begins to happen soon after their first birthdays and slowly gains momentum as they approach eighteen months. All of a sudden, they like books again. They sit on my lap and listen contentedly. They point to pictures. They make animal sounds. They ask for the book again . . . and again. Clark has been no exception to this pattern, but that doesn't make it any less miraculous. The whole family is enjoying his requests of "read book please." It's kind of fantastic to have five willing readers now instead of just two. I'm telling you, this kid is spoiled. Because we are doing a lot of reading now, I wanted to share some of Clark's current favorites. But first, a disclaimer. This list is made up almost entirely of classic children's books. If you're looking for new recommendations, you'll have to look somewhere else. Clark, of course, doesn't know that these books have been around for ten, twenty-five, fifty years. He just knows that he likes them, and I kind of love seeing him gravitate towards them just like his older brothers did. Many of them have been reviewed here before, but I'm mentioning them again so I can capture a bit of Clark right now (and maybe remind you of some of your beloved favorites, too). Since I already warned you this would be a list full of classics, I might as well start out with one of the most iconic children's books of the twentieth century. 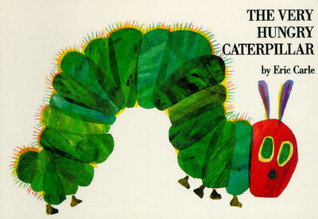 I'm sure their are readers out there who don't love it (there always are), but from my viewpoint, this story about a gluttonous caterpillar who gorges himself for a week is pretty much universally loved. At least it is in our house. Clark loves pointing out all of his favorite foods, and I love nibbling his neck while the caterpillar nibbles a strawberry. This book has a lot of flaps, and if you're like me, then you probably try to avoid such books, but hear me out. Each page contains probably ten to twelve silhouettes of different animals. Open each flap, and you find a photograph of the actual animal. 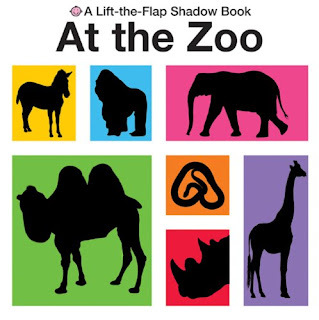 I love this book (and the other ones in the series) for several reasons: 1) The silhouettes add a fun little guessing game element to the book, 2) It features quite a wide range of animals, and 3) The photographs make it feel more real. I was a little overly protective of the book when we first got it when Aaron was a toddler, but I've loosened up a bit with each child, and it's held up remarkably well. When Aaron was born, one of my good friends gave me a box set of Brown Bear, Polar Bear, and Panda Bear. Believe it or not, four kids later, those same board books are still kicking at our house, but only just. They have been read so many times, the edges are scuffed and worn soft, the binding is coming apart, and we all can recite them in our sleep. 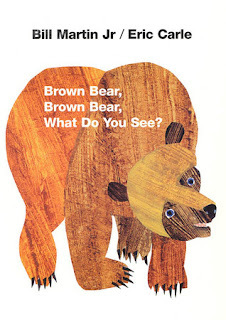 When Bradley was Clark's age, he loved this book so much, Mike made him a Brown Bear cake for his second birthday. Clark's favorite page is the last one where all of the animals are shown together. He likes to point to the correct picture when I say, "Find the blue horse" or "Find the red bird." I keep hoping it will help him learn his colors, but so far it hasn't worked. 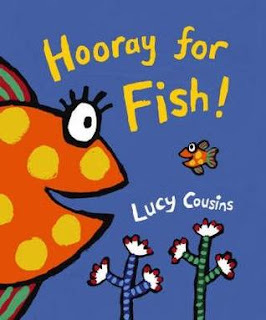 Little Fish takes readers on a tour of his ocean home and introduces them to all his fishy friends. 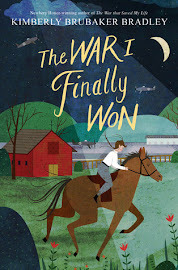 Lucy Cousins' broad strokes and bold colors are eye-catching of course, but other than that, it's a pretty average story. And yet, all of my kids have loved it. It might have to do with all of the little things we've added over the years: chomping their tummies when we get to the "scary fish," changing voices when we read "fat" and "thin" fish, and giving three quick kisses on the cheek when we find Little Fish's favorite fish. Or it might just be because of those illustrations because really, who can resist Lucy Cousins? 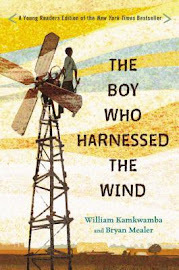 Most of the books on this list are family favorites, but Mike has firmly told me that he doesn't really love this one. No matter. I bought it for Clark for Christmas anyway, and he loves it. 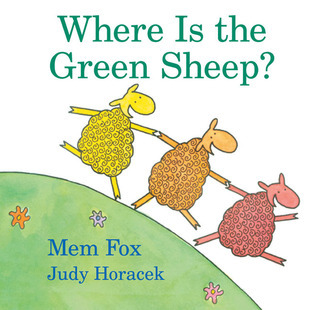 The reader spends the entire book looking for the green sheep. He finds the sun sheep and the rain sheep and the moon sheep and the star sheep, but where is the green sheep? (Clark always answers, "I don't know.") The lilting text is perfectly repetitive, and the sheep are silly and unexpected. Mike might not be a convert, but the rest of us are. 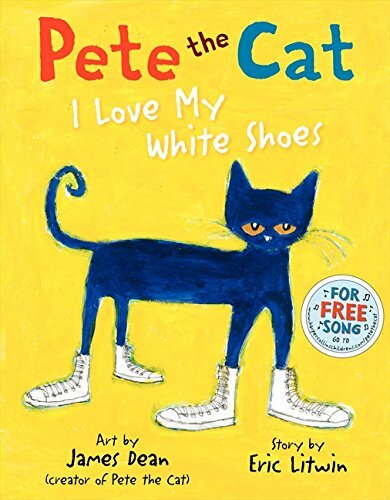 I don't think you can call Pete the Cat "a classic" (although it is very popular), and it's also not a board book, so it probably shouldn't be on this list at all except that Clark loves it, and that's what I'm really trying to showcase here. It had been quite awhile since I'd sung the "I love my white shoes" song to any of my kids, but it came right back to me. I have mixed feelings about Pete the Cat though. We've loved this one since it first came out in 2010. And the ones that followed (Rocking in My School Shoes and Pete the Cat and His Four Groovy Buttons) are not bad either. 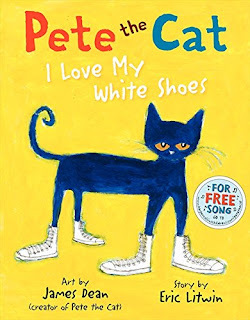 But then, as so often happens with popular books, someone decided it would be a great idea to make a whole line of early readers based on Pete the Cat, and they don't have the same personality as this one. So I guess what I'm saying is, if you haven't read any Pete the Cat before, don't think that you can just go to the library and pick up the first one you see and it will be a winner. I guess it's probably fairly obvious from the featured books on this list that Clark is a fan of animals. This one though is more than just a collection of animals thrown together. 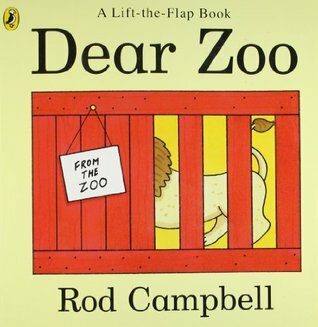 It's a simple story about a kid (I always assume it's a boy, but I think that's just because I only have boys) who asks the zoo to send him a pet. He gets all sorts of animals shipped to him, but for one reason or another (too fierce, too grumpy, etc. ), they're just not quite right for him. Fortunately though, the zoo finally finds the perfect pet. 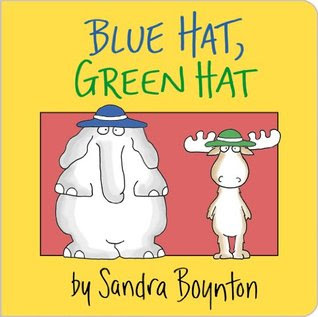 For years, I said that Hippos Go Berserk was my favorite Sandra Boynton board book. But then I got Clark Blue Hat, Green Hat for Easter, and the first read-through prompted the most delightful, unadulterated giggles I have ever heard, and I switched loyalties just like that. Seriously though, if you think that a book with only a handful of words and approximately six pages can't be funny, then you clearly have never read this book about a turkey who just can't seem to get his clothes on correctly. For a toddler whose daily life is a struggle of the same, it is hilarious. One of Clark's early words was "spidey," which made me remember this book . . . and also realize that I hadn't seen it around our house in a very long time. After a thorough search, I decided it really was missing and promptly bought a replacement copy. It only took one time through for Clark to be a devoted fan of this story about a spider who can't be bothered by all the other farm animals because she is so busy spinning her web. 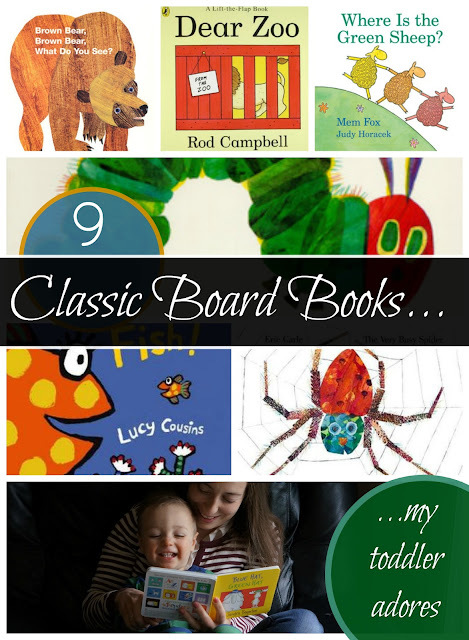 Which classic board books have your kids loved? For more favorite board books, click here. Love this post! These are some of our favorites too- I just ordered Pete the Cat- I've heard so many good things about it! We love Little Blue Truck, and anything by Richard Scary too- also There's a Nightmare in My Closet and The Monster at the End of this book are some of our favorites (though not board books). Where do Diggers Sleep at Night, Love Monster and I Aint Gonna Paint No More (or as Jude calls it, "the messy baby story") Tyler's favorite to read to Jude is Jeremy Draws a Monster. I guess we are into monsters and trucks or something- haha! What a great list of books! 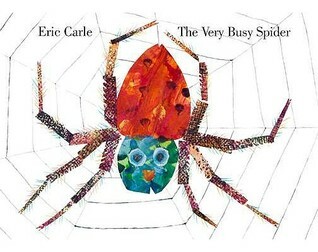 I love Eric Carle's work (especially the one about the mosquito). What is the mosquito one called? I don't know if I've ever read it! Such fun suggestions! Leslie Patricelli is one of my favorite modern board book authors. Thanks for sharing at the #LMMLinkup. Yes, we love Leslie Patricelli too. 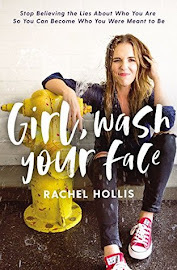 She's been featured in one of our other board book posts! Familiar with most on your list, particularly the Eric Carle are favourites. However I'm with Clark, can't stand Where is the Green Sheep, sends me screaming. Far prefer some of Mem Fox's other ones. There's the "That's Not My [Whatever]" books with different textures. My kid was a train fanatic so we read the "That's Not My Train!" a few zillion times. Also some photographer who dressed babies up as dinosaurs? For some reason that was a huge hit. Oh yes, we have the dinosaur one in that series, and we like it! Okay, I'm going to have to check that one out and sing it to that tune! There are a couple of these I've never even heard of! Shows how much I know. :) I'm kind of sad, actually, that my kiddos are growing out of board books. My youngest will be 4 this month, and he'll still pick them at the library, but the others don't. In addition to the Eric Carle and Sandra Boynton, we really liked the "How do Dinosaurs..." series. Also, pretty much anything with fuzzy/textured pages. I know! I'm sad for that day to come! I don't mind fuzzy/textured pages unless we check them out from the library. Then they gross me out!